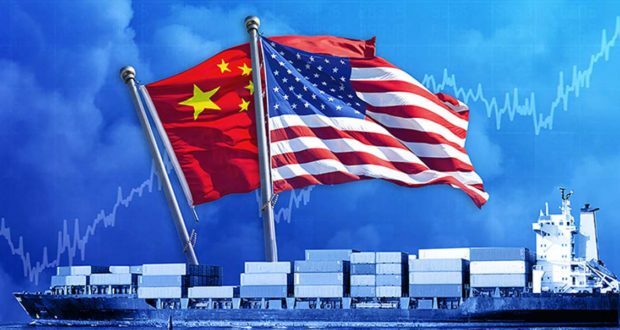 When President Trump announced intentions to place tariffs on goods from Canada, China, Mexico, and the European Union, I knew the effects on the markets would be widespread. I wasn’t sure how long the spat would go on, but I knew that the longer it went on, more markets would be affected and the impact would increase. The effects are spreading to other countries and to the commodities markets. One area that was bound to be affected was the currency markets. We have seen the U.S. dollar climb sharply in the last four months. 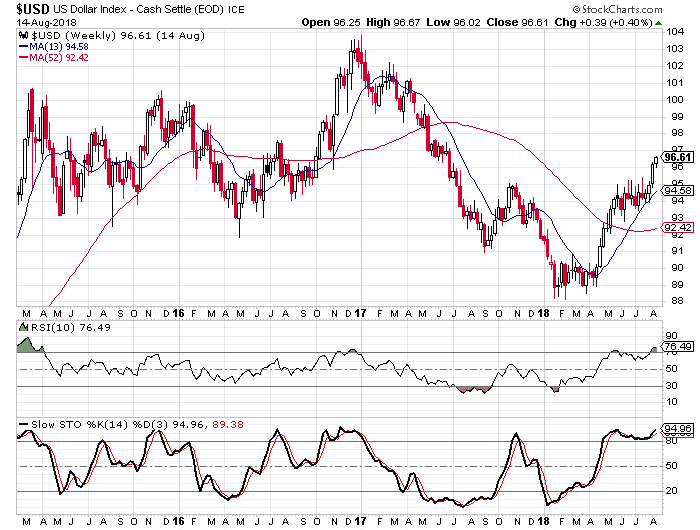 The chart below is of the dollar index and it measures the currency against a basket of other currencies. You can see that it has increased approximately 10% in the last four months. China’s yuan, Russia’s ruble, Turkey’s lira— all have been falling against the dollar. Even countries that aren’t targeted in the tariffs have had to take action to protect against their currencies falling. Indonesia raised interest rates to try to keep the rupiah from falling further. Unfortunately for President Trump and his goal to lower the trade deficit, when the dollar gets stronger against other currencies, the trade deficit widens. Think about it, the dollar index has jumped about 10% in the last four months. That means that with the same number of dollars, U.S. consumers and companies can buy 10% more goods from the likes of China. At the same time, Chinese consumers get approximately 1o% less in goods for the same number of yuan. The rally in the dollar is working against President Trump’s policy of lowering the trade deficit with China. 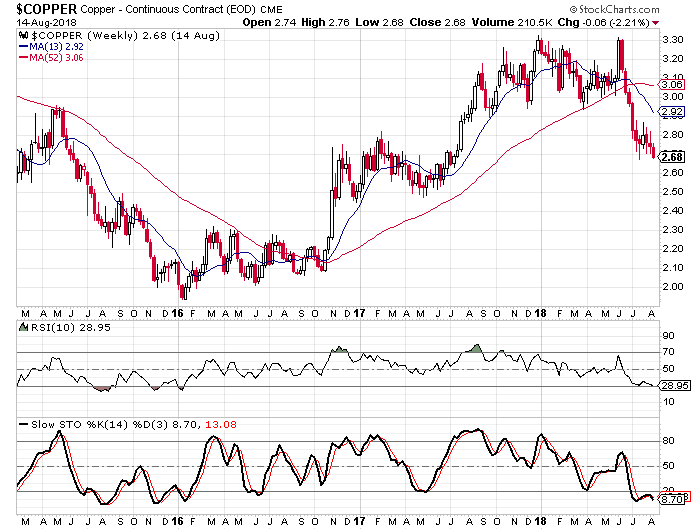 Another casualty of the strong dollar and the trade war is falling prices in base metals. Since the spat with Turkey started and the tariffs were implemented, copper has dropped sharply. Copper isn’t the only base metal that has been falling either. Aluminum, platinum, and zinc have all been falling over the last few months. Investors are concerned about global growth slowing down and the trade war is a contributing factor. All of these headwinds are leading to uneasiness from investors all around the globe. On Wednesday, bond rating agency Moody’s issued a downbeat forecast for South Africa’s economy and that led to some speculation that the rand could be the next emerging market currency to take a nosedive. All of these developments—Turkey, South Africa, Russia, China, falling prices in base metals… they are hitting economies and markets everywhere. The one economy that does seem to be holding up, even if the equity market isn’t, is the U.S. Most economic indicators in the U.S. show growth continuing at a constant or faster pace. But how long can that go on? If the rest of the world slips in to a recession with lower demand for goods and services, it will eventually hit the U.S. The world economy is too intertwined for the U.S. to stand alone against an economic slowdown. We really need for negotiations to resume and for diplomacy to work somehow. I have said many times that the trade inequalities needed to be addressed and I have lauded President Trump for taking on the challenge. However, I am getting concerned that the strategy being employed is going to end up sending the world and the U.S. in to a recession and the stock market in to a bearish phase. I am by no means an expert on trade, but this is a problem that has been bothering me for years. I believe for a country to survive the ideology, whether it’s capitalism, socialism, communism, or something else must support the people and not the other way around. If I’m not mistaken, socialism and communism only came about before of the failures of capitalism to meet the needs of the every day citizen. Don’t get me wrong because I believe capitalism is the best option, but somehow it must be used to benefit the entire population of the US. If I’m not mistaken, isn’t the stock market based on how large of a profit a company makes and therefore encourages businesses to move toward a maximization of its profits? Since profit maximization means developing a product or service at its lowest possible cost and selling it at it’s highest possible price, doesn’t this automatically hurt American workers since human resources is the greatest cost to businesses? Before the global economy moved businesses offshore, as profits increased the rule of supply and demand benefitted all Americans. As demand increased, profits increased and with that the need to hire more workers. This gave this country the resources necessary to support our infrastructure. As a result, most Americans were able to put bread on their tables and a roof over their heads. After globalization, profits continued to increase, but the majority of increased jobs did not occur on this country. This has resulted on fewer tax dollars to support our infrastructure and to make it worse we have millions of illegal immigrants making greater demands on that infrastructure. I believe, as world history has shown, if we do not find a way to create more American jobs and bring other jobs back, the people will eventually revolt. So, my question to you is how this can be accomplished in today’s economy. I don’t like to encourage protectionism, but something must be done before it’s too late. Republicans Retain the Senate, Majority of Governorships, Lose the House – Ramifications?